If you have learning and skill development from work and life, but still need your college degree, take a quick survey to identify your subject matter expertise. Prior Learning Assessment (PLA) provides college students with the potential to earn credit for college level learning acquired outside a traditional academic environment. In other words, it is an evaluation of a person’s life learning for college credit. That learning could have been acquired by working, participating in an employer’s training program, serving in the military, studying independently, performing volunteer or community service. Prior Learning Assessment (PLA) is conducted through an evaluation process. PLA can be assessed in a number of different forms, such as a portfolio assessment, credit by examination (e.g. CLEP Exams or CCBC Departmental Exams…etc. ), or even by Articulated Industry Credits (e.g. CISCO Certification, etc...). Click on the links below to learn more about the PLA options available to you at CCBC. What is CCBC's PLA acceptance policy? Students must earn at least 25% of the credits required for a program of study, directly through CCBC coursework. They may earn up to 75% of the credits required for a program of study, through Prior Learning Assessment (PLA). *Individual exceptions can be considered by emailing transfereval@ccbcmd.edu. This requirement does not apply to Credit by AP, IB, and the Articulated Construction Apprenticeship programs. 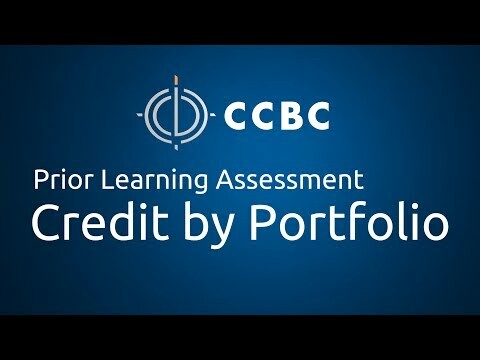 This video explains the process of obtaining college credit by prior learning exam at CCBC.